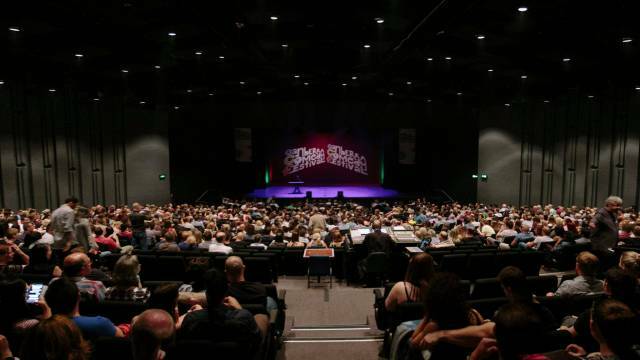 The Canberra Comedy Festival brings a weekend packed with laughter. Photo: Visit Canberra. The Canberra Comedy Festival is in full swing and if you haven’t caught a show yet there are plenty on this weekend, including free shows at the Festival Square in front of the Canberra Theatre. The Handmade Markets are on again at Exhibition Park and the ACT Antiques and Collectables Fair will be taking over the Albert Hall all weekend. The National Gallery has a new exhibition opening this weekend celebrating the Maori cultural art form of Ta Moko with demonstrations, talks and panel discussions this Saturday. And on Sunday the Canberra Tennis Centre is encouraging girls to get active ahead of the ACT Claycourt International tournament finals. And if you have kids and haven’t booked a babysitter don’t despair, the Clean Comedy Spectacular is on at the Street Theatre, 5:15 pm Saturday, Matt Grey is performing his show Game On 2.0 at the Courtyard Studio Saturday & Sunday 1 pm and Emma Malik is performing her show Fee-Fi-Fo-Fun with a cast of animals in the Festival Square on Saturday & Sunday at 2:30 pm. Check the full program and book tickets here. The Handmade Markets are on again this weekend with stalls selling wares from 260 local and interstate designers and producers. There will be stalls selling art, books, fashion, kids’ stuff, Canberra-themed produce, furniture, homewares, food, stuff for the garden and more. All set in a relaxed environment with plenty of food and good coffee to sustain you and live music to enjoy. Tickets from $20, book here. The twice-yearly ACT Antique and Collectables Fair is on this weekend with 24 antique dealers exhibiting and selling furniture, maps, prints, jewellery, dolls, fine books, china, pottery, clocks, watches, glassware and bric-a-brac. Light lunches and refreshments will also be available at the fair. Entry is $10 for adults, $8 for concession and kids under 14 are free. Proceeds from the fair will go to the local chapter of the charity CanTeen, that supports young people aged 12 to 25 years living with cancer. A new exhibition is opening at the National Gallery this weekend—Maori Markings: Ta Moko. To mark the occasion artists from Toi Maori Aotearoa in New Zealand will be demonstrating the practice and philosophy of Ta Moko—the unique Maori art of marking the skin with connecting patterns that tell of prestige, authority and identity. The exhibition will explore this tradition from its origin in the legend of Mataora and Niwareka, and the earliest European records of the practice, to its contemporary resurgence from the 1990s. It will include important early Maori sculpture, nineteenth-century prints, paintings and photographs and contemporary photographs. The portraits in the exhibition span 250 years and include images of men and women influential in Maori history including: some of the first illustrations of Maori people made during Captain Cook’s voyages, the chiefs who travelled the world in the early nineteenth century, the signatories to the Treaty of Waitangi, and people who openly defied the colonial government during New Zealand’s land wars of the mid-nineteenth century. Other live events this Saturday include weaving demonstrations, talks about the exhibition and a panel discussion with Maori artists on the philosophy and cultural practices associated with Ta Moko. The exhibition will be on until 25 August. The ACT Claycourt International tournament has been playing all week at the Canberra Tennis Centre with the finals on this weekend. This tournament is an ITF Pro Tour women’s event, with USD $25,000 of prize money available. The finals will be this Sunday from 11 am. But before the finals, the Canberra Tennis Centre is hosting a Girls Make Your Move event to encourage and inspire young women to be active. A number of sports will be at the event including AFL, basketball, rugby, cricket, hockey, netball, volleyball and, of course, tennis! There will also be free yoga and Zumba sessions, a jumping castle and face painting. And the first 100 girls (aged 18 and under) through the gates will receive a free racquet. The Canberra celebration of Holi Mela is back for another year and has moved to Stage 88 in Commonwealth Park. Holi is a Hindu festival held at this time in the Indian subcontinent to celebrate the end of winter and the arrival of spring festival and involves smearing people with coloured powder and spraying them with water. Join the Canberra version and enjoy live music and dance performances, food, drink and getting drenched in colour.